"There is generally no better ally for a girl than a great belt, since the waist is invariably always good to highlight -- nothing accomplishes this more effectively than a waist-cinching wrap. And in this age of the voluminous top, it's the best means for tackling all that extra fabric, too, which generally drowns a lot of girls' figures." I love nothing more than wearing a feminine and voluminous floral dress and cinching it with my favorite brown leather braided belt or a tweed pencil skirt with a skinny metallic belt. And a basic leather belt keeps me from constantly pulling up my skinnies (skinny jeans) while running errands. So whether it be worn inside belt loops or at my natural waist, belts are a great accessory and an absolute must-have in a woman's closet. "Skinny belts are best worn cinched over really lightweight pieces -- like a dress, cardigan, or a combination of the two. Thin fabrics are key here, so if you have a delicate item, like a long blouse worn with pants or a skirt, go for an equally svelte (slender) belt at your natural waist. Medium-width belts are definitely the most versatile option of the three styles. You can wear them traditionally looped through jeans or trousers or low-slung to rein in a loose dress or tunic. Since you need it to fit at both the mid-waist and on the hips, we suggest buying a slightly bigger size that accommodates both." The basic idea is that the lighter and more delicate the fabric of your outfit choice is the better it is to be paired with a skinny belt. And in comparison, with thicker fabric, like in a sweater dress for example, opt for a medium or wide belt. Now that you've sorted out the difference between different kinds of belts [who knew they even existed?!] the next questions you should be asking yourself are how do you properly wear it? What's the importance of your natural waist? What's the difference between your natural waist and your hips? You should already be aware of your human anatomy, but sometimes I feel as if some women are a bit confused about the distinction between their waist and their hips. When you wear a belt through the hoops of a pair of jeans or work trousers, unless it's a high waisted style, belts are usually positioned at the waist. If you decide to wear a belt with a strapless sundress, a maxi dress, or basically anything that doesn't have belt loops, your belt should sit at your natural waist. Nothing irks me more than seeing someone wear their belts either too much below their natural waist or too much above. Just know that your natural waist lies in between your chest and your hips, just above your belly button. In short, it's the smallest section of your torso. Wearing a belt at your natural waist is the perfect way to showcase your womanly figure in a very flattering way. But if that's too complicated for you to comprehend, a much quicker and easier way to find the perfect placement for your belt is to look at the garment itself. The proper belt placement can be easily spotted especially with dresses. A dress consists of two basic parts: the bodice, which is the top half of the garment, and the skirt which is the bottom half. The break off point at which these two pieces meet is the perfect spot for you to adorn your outfit with a belt. Find where those two parts connect and wonder no more! 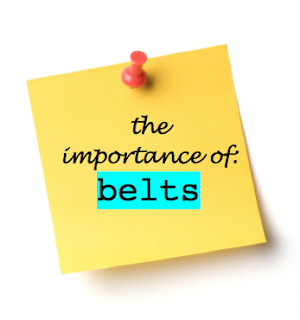 Belts are another great and inexpensive accessory worth investing in. Almost all clothing stores sell them and in various styles, sizes, and colors. But do be careful of quality. Belts come on and off as often as you change your clothes so keep that in mind when you make your purchase. I usually opt for leather belts because they're the most durable and sturdiest material out there. So if you must buy one that's made of synthetic material, please make sure that it's one that won't snap or tear off after a couple of wears. Try it out and happy belting! Loooooovee all your belts.... i think belts can make an outfit and you can totaly make your own belts if you dont want to spend alot of money on a really cool belt... i made a studded spike belt and it was super easy to make.. check it out if you'd like. very well explained...very informative blog , thank you for sharing this !!! Thanks for sharing such a beautiful post. I love the model of this Belts. Although i don't like to hunt Belts, but in this case i love to use it. You can check out William Penn website to overcome Branded belts like this! Fashion enthusiast with a dream of becoming a fashion editorial stylist like Grace Coddington of Vogue and Havana Laffitte of Teen Vogue. FOLLOW us on our Official Twitter Page! LIKE our Fashion Blog Facebook Page! Looking for a memorable blog post within the Stylist Fashion Blog? Search the Blog Here! What Should I Wear For..